Insurance Refuses to Pay for My Uber Accident. Is That Legal? Home » The Law & You » Insurance Refuses to Pay for My Uber Accident. Is That Legal? A viewer says he got into an accident while driving for Uber. Now his insurance is refusing to pay because he was using the car for commercial reasons. Is that right? Uber accident attorneys Greg Fellerman and Ed Ciarimboli explain what to do in this situation. Dave Kuharchik: It’s time once again for “The Law & You” and I got to admit, we’re excited tonight to be from our new virtual law center. This place is awesome. Ed Ciarimboli: This is pretty cool. Dave: Welcome to our attorneys Greg Fellerman and Ed Ciarimboli for “The Law & You.” Gentlemen, it’s good to see you here today. Ed: We’re not virtual lawyers. Ed: We’re real live lawyers. Dave: We’ve taken the segment right into the 2020s. Ed: This is great. This is pretty slick. Dave: Same old good advice so lets get to the question tonight. This is from Dave in Moosic. Dave says, “I drive for Uber. While leaving the airport, I got into a car wreck on 81. Now my insurance company says it’s not going to pay because I was using the car for commercial reasons. Are they right?” Ed, what do you have to say to Dave? Ed: This is a very interesting question and obviously a lot more people are becoming Uber drivers, trying to earn extra money. But the reality is, your personal automobile insurance company, they might be right on this. There may be a valid exclusion in that policy which says you’re using the vehicle for a commercial purpose, which is what Uber is, then you are not going to be excluded from coverage. Now, Uber on their app, whenever you sign up you can buy insurance from Uber and sometimes Uber will force coverage as well. So, I think at the end of the day there might be coverage but your insurance company may be right on this. Greg: No we’ve seen this a lot with commercial; for example, a pizza driver, any type of delivery. We’ve seen these exclusions. We’ve had a couple of Dominos drivers where their coverage was just void because they were driving for a commercial purpose. Just take it from the insurance company’s perspective, you didn’t buy the risk. They think you’re just a regular driver, driving from A to B every day doing normal stuff. When you take on a commercial risk, the risk goes up. So, in all fairness to the insurance company, you should have a separate policy. Ed: Absolutely. I actually looked at the app and when you sign up to become an Uber driver, there’s a whole provision on the application about insurance coverage. So if you want to do it, make sure you read the fine print. Dave: So we’re talking about Uber, this is all futuristic. Ed: We got the cell phones out. This is great. 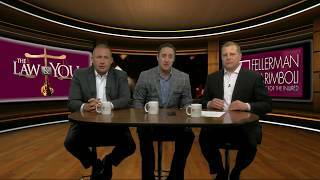 Dave: Don’t forget, you can get a hold of the guys by giving them a call or checking them out online and results matter with attorneys Greg Fellerman and Ed Ciarimboli. Thanks, guys.